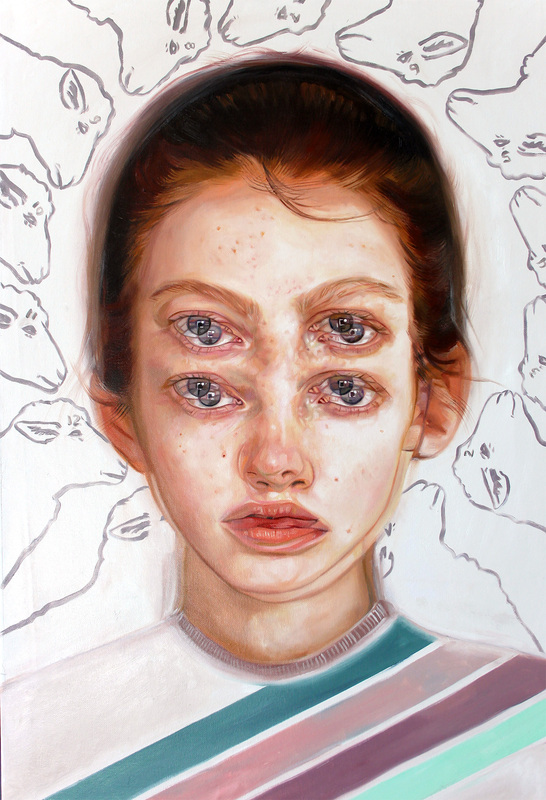 Thinkspace is pleased to present Voyage of The Insomniac, featuring new works by Toronto-based, Canadian, Québéquois artist Alex Garant. 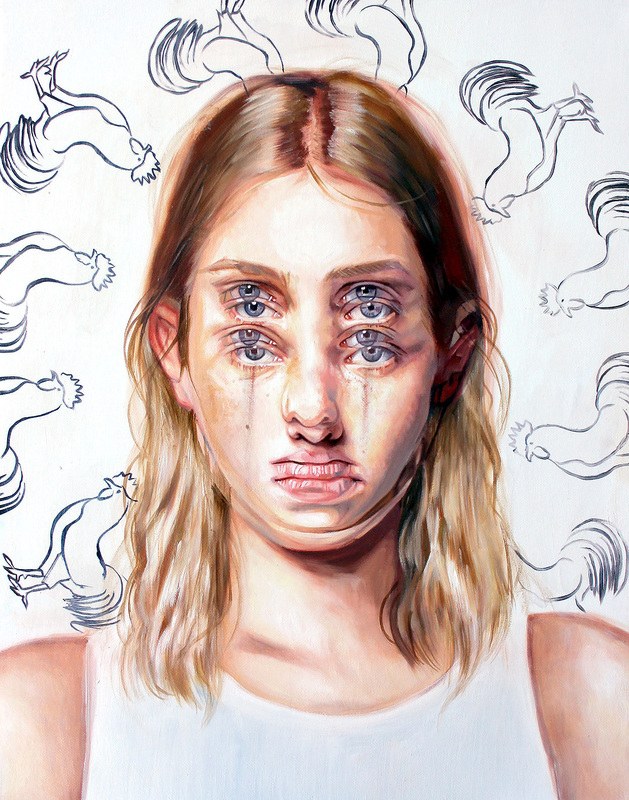 A painter known for her hyper-realistically rendered portraits in which the faces and eyes of her subjects seem to skip their registers through image redoubling and superimposition. 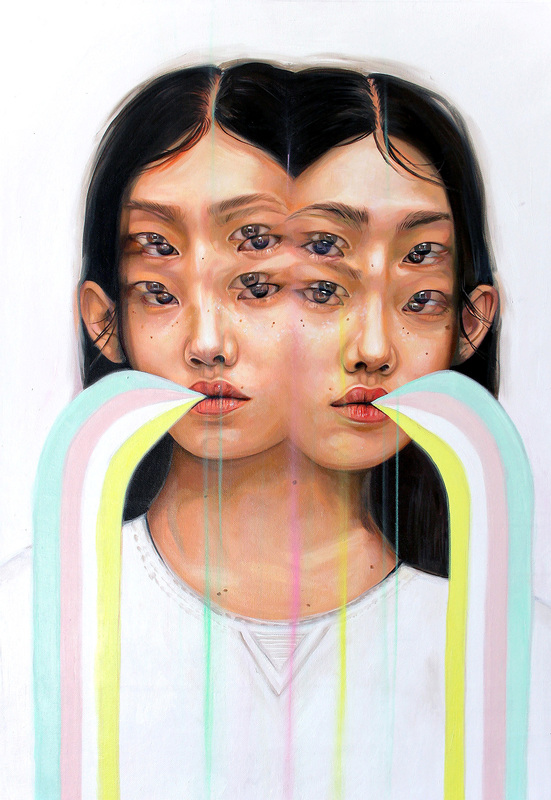 In anticipation of Voyage of The Insomniac, our interview with Alex Garant discusses the exhibitions challenging work, an explanation for the compositions movement, and the catalyst for her artistic journey. Join us Saturday, August 4th for the opening reception of Voyage of The Insomniac, from 6 pm to 9 pm at Thinkspace in Culver City. SH: How do you approach developing a new body of work? Were there specific themes or techniques you wanted to explore in “Voyage of the Insomniac”? AG: Voyage of the Insomniac was a very personal series. For the past couple of years, I have been experiencing bouts of insomnia, and I have been struggling with sleeping well. Unfortunately, I am the kind of individual who needs a lot of sleep. The lack of Z’s ended up putting me through quite a few days of hazy wakefulness, in a sort of automated trance. This collection is inspired by those days; the awaken hours passing by, lost between overstimulation and mental confusion. Trying to find beauty in overthinking and attempting to embrace the haze. The collection is a total of 13 new paintings, 12 of them representing each hour between midnight and noon and a 13th painting (The 13th Hour) representing the eternity of a sleepless moment. SH: Is there a symbolic significance to the double vision aspect of your work? AG: Many people say it’s hard to look at yet is what draws the viewer to the piece. For me, the vibrancy is a visual representation of breathing, living, experiencing one’s self. In regards to this specific collection, I would compare this to a mirror reflection experience. When you are so sleep deprived and walk in front of a mirror, you look at yourself and wonder: Is this me? Is this what I look like? Is this how people see me? Then you smile, thinking, I can look decent, and then you stare into your own soul, witnessing your own struggles. That duality is what I am trying to represent in my imagery. AG: My favorite piece for this show is “The 13th Hour”. Strangely enough, this is the last piece I worked on for the show; I find I was able to capture the emotion from which this entire series started. Whenever I produce a larger body of work in a condensed period, I find myself learning a lot, on a technical level but also how to translate the intangible ideas into something others can see. This painting is the most direct visual translation of what was on my mind at that moment. SH: Where do you source inspiration? AG: It depends, sometimes, I have ideas of colors or patterns I want to try, most of the time, it is more of an emotion I am trying to render. I strive to get all my inspirations from within myself and avoid getting influenced by external sources like social media or anything of that nature. AG: I do a lot of little doodles. My first ideas are often little stick figures and some simple lines just to help me remember the idea. I will grab anything close to me, napkin, notebook or sketchpad. I also have a few very silly notes on my phone such as “Boy with red lines,” or “snooze roosters,” I don’t think it would make sense for anyone but me hahaha. AG: I am very attracted to symmetry and balance, resulting in my compositions being very simple and slightly stiff. I don’t like to add elements for the sake of adding stuff. I prefer a minimalist approach to my pieces. I want the viewer to have a one-on-one encounter with the character painted, without distraction. 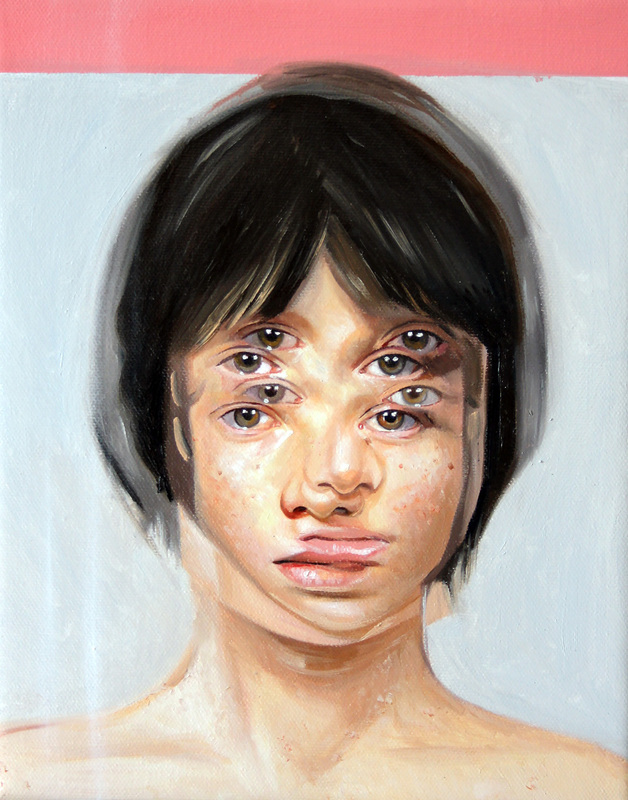 I want the viewer to relate to the subject, projecting his/her own experience. AG: I love sketching, I love the early steps of the process, refining the idea, drawing the preliminary composition, etc. I am also learning to love the detailing process at the end. Adding texture and mini glazes. AG: Sometimes, an idea is so great in your mind, but then you just can’t put it down on paper, or you start painting it, and the whole thing turns muddy. It happens a lot, and over the years, I still struggle to let go of a piece once I start working on it; eventually, some pieces don’t make the cut and will be destroyed. I want to stay humble and always keep learning. For that to happen, it is important to push yourself and experiment while producing new works. This improvement process sometimes results in not-so-great art. Instead of getting frustrated, I need to learn to accept the lesson, absorb the learning and move on with the new skills (hopefully) acquired. SH: What is an aspect of other’s artwork that really excites you, what are you drawn too? AG: I am a huge art fan girl. I worship anyone one who comes up with ideas, concepts, and images I could never think of. I love colors and bold lines, I am a huge fan of Michael Reeder, Benjamin Cook, David Cook, Ryan Heshka, Travis Louie, Dan Lam, Richard Ahnert, Jeremy Okai Davis, Tina Lugo, 1010, Double Parlour, Caitlin T. McCormack and I could just keep on going and going… I love new ideas and people who master their own craft. AG: Sooooo many ideas. I really want to do more collaborative projects this year. Indie movies and musicians. Weirdly, I would love to do some kind of painting/ collab with Gucci. I have been loving their social media editorial content lately. Also, I am currently working on a print collab with artist Paul Jackson I am super excited about. AG: When I turned 30, I suffered a massive heart attack, and it truly changed my life. I felt reborn and refocused on what is important. I suddenly knew I needed to direct my energy towards art and that it was my true calling. I also understood that living passionately was key. Time is the only currency we are all running out of. So, this sense of urgency started translating into everything I do. No time to wait or to be hesitant. You must commit and keep fighting.